Scientists have found small particles inside the sample container of the Japanese asteroid probe Hayabusa, though it remains to be seen if they are asteroid bits or contamination from Earth. 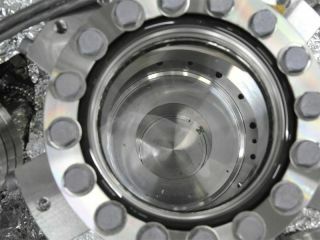 Here, particles are visible in re-entry capsule's sample container in a photo taken through the window of JAXA's sealed curation facility on June 28, 2010. Full Story. Japanesespace officials have found intriguing dust-like particles inside the samplecapsule from the asteroid probe Hayabusa, but whether they are actually piecesof an asteroid or contamination from Earth remains to be seen, Japan's spaceagency announced Tuesday. Thetiny particles were discovered after scientists opened the Hayabusa probe'ssample container, which returnedto Earth on June 13 after a seven-year journey to the asteroid Itokawa. Scientists began opening the capsuleon June 24, officials with the Japan Aerospace Exploration Agency (JAXA) said. In a Tuesday statement in English, JAXAofficials said scientists are unsure if the particles are asteroid samples or contaminationfrom Earth. The announcement cameafter earlier Japanese news reports stating that trace gases had also been found insidethe capsule. Japan'sHayabusamission was an ambitious expedition to return the first-ever samples of anasteroid back to Earth. The robotic spacecraft launched in 2003, but sufferedseveral failures ? including malfunctions with its sample collection devices. TheHayabusa probe landed on Itokawa twice in 2005 in attempts to collect asteroidsamples. Mission scientists hoped that at least some bits of the asteroidItokawa, a silicon-rich space rock, managed to fly inside the spacecraft'ssample capsule for return to Earth. Thisgraphic shows how the Hayabusa asteroid mission worked. Miwadasaid the particles found inside the capsule's sample container and samplecatcher show up clearly in two photographs released by JAXA. "Wecan see some gray particles and some white ones," Miwada said in an e-mailof sample container material. "Scientists believe them as particles ordust that came in during the ground operations or inside the spacecraft, thoughthey are going to analyze the particles carefully comparing with the grounddust samples." Moreparticles were found inside one of the chambers of Hayabusa's sample catcher,another part of the probe's asteroid sampling system. Twotiny particles, each just 10 micrometers in size, were discovered inside Chamber A ofHayabusa's sample catcher, Miwada said. The chamber was used during the probe's secondlanding on asteroid Itokawa. Andthese particles are expected to be just the beginning, JAXA officials said. "Scientistsare continuing [the] survey of Chamber A for some weeks, followed by the surveyof Chamber B," Miwada said. "So we expect much more particles." TheHayabusa sample capsule is being studied at a JAXA facility in Sagahimara,Japan, where scientists are cautiously working to open the capsule and searchfor particles while avoiding any chance of contamination. "TheJapanese are conducting this sample extraction process rather slowly ? as theyshould," Don Yeomans, NASA's project scientist for the Hayabusa mission,told SPACE.com recently. Researchershope that any samples of the asteroidItokawa inside Hayabusa's sample container could offer new insights intothe composition and other characteristics of space rocks throughout the solarsystem. ?